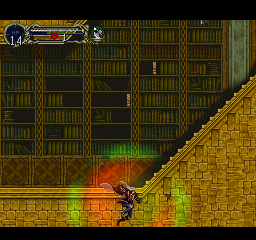 PSX Castlevania: Symphony of the Night (USA) "Replay Mode" in 13:38.15 by ForgoneMoose. This run is about twenty seconds faster than the previous version due to a changed route that makes different use of glitches. More details can be found in the author's comments. A 100% run covering the whole castle is also available. If you want to see a run that starts from a clean save, you may enjoy this run. If you prefer the main character to have muscular bare arms and pray to the rain gods to defeat bosses, you may enjoy the Richter version.